Don’t Let Prime Marketing “Real Estate” Go Bare! Windows and glass doors are often overlooked as a place to market your products and services. Make sure you take advantage of all available space when you are advertising your business. Window graphics, if done right, can be very effective in promoting your business and drawing customers into your shop. How many businesses do you pass with really boring windows? Better yet, how many have advertising that is unattractive and unexciting? 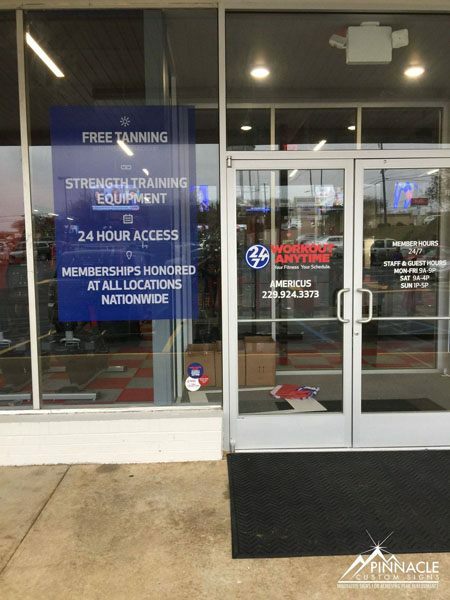 Most people think that the only window graphics they need are putting cut vinyl lettering on their business’ doors indicating hours of operation. While this is truly important in order to let your customers know when you’ll be there, it is not the only option. 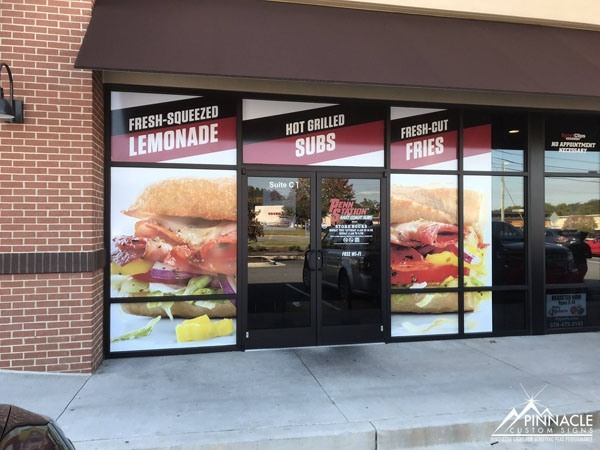 Here are some different ways to use window graphics to make your window entice your customers to “come on in”. Use Full Color Graphics made of a special vinyl that allows you to showcase your business on the outside and not reduce visibility from the inside. These can cover the full window or just a partial area. Add your Logo to clearly brand your location. Incorporate Pictures or other Printable Images, such as your featured products. Create an elegant etched glass appearance at a cost much lower than frosted glass. 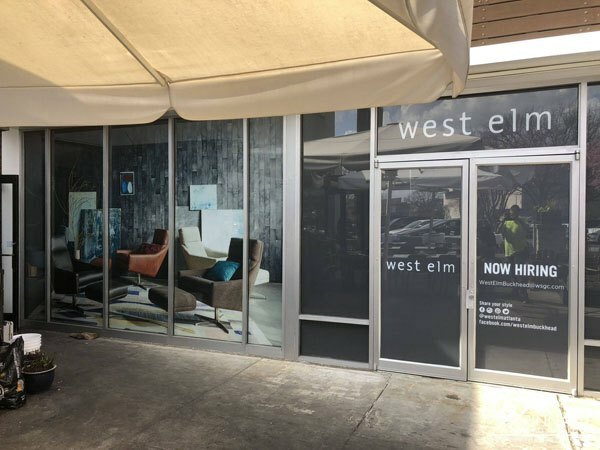 Our team will work with you to understand the look you are trying to achieve and determine the best materials provide you just the right window graphics to meet your need. You Can Also Spruce Up Your Vehicle’s Windows with Custom Graphics! For many business owners, their trucks or work vehicles drive 1000s of miles each year with inadequate signage. A large number of small businesses believe they can’t afford a car wrap. However, that doesn’t mean you shouldn’t do something to advertise your business as you drive around town. Let us design custom window graphics to go on the rear window of your automobile. This will get just as many views, if not more, than you would renting a billboard on the interstate, at a fraction of the cost. And, if done right, it can also look as though you invested much more with your advertising dollars than you actually did. create a professional, welcoming environment. How can we do this? Let’s start with bringing in new business. Most businesses with a storefront will have windows. These windows help proved natural lighting and give people the ability to see from the outside in and vice versa. 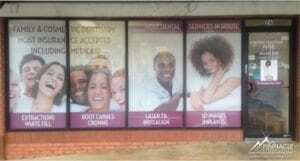 These windows also give you the opportunity to advertise your business. Aside from the standard hours of operation and business logo, you can use your windows to display images of your business (ie. dentist work) or specials (ie. seasonal specials). Depending on the type of vinyl used, you can give a certain amount of privacy to your space. Many companies use perforated vinyl on their front windows to give customers inside privacy while allowing light in and allowing people inside the ability to see outside. Another option would be to use frosted vinyl to obscure sight through either side of the window /or/ opaque vinyl to completely block out the ability to see from one side to the other. Both options also decrease the amount of natural light allowed through. Vinyl window graphics don’t have to be used for advertising. 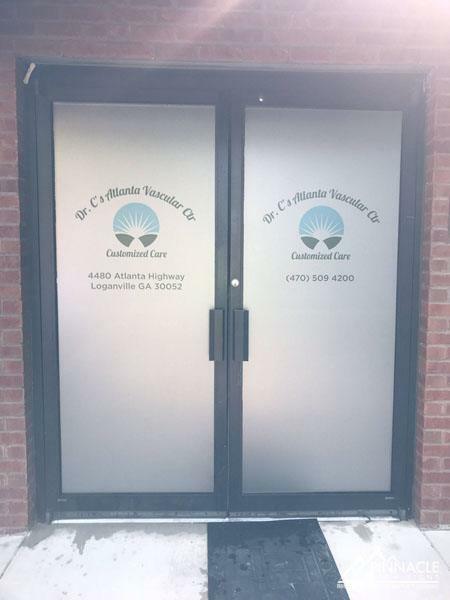 Many businesses use them to create a professional environment by frosting windows, wall, or doors and adding a logo or wording. 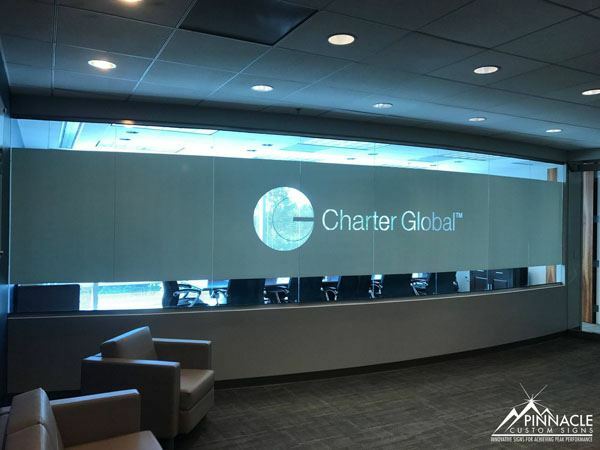 One of our customers used white opaque vinyl on the glass window/wall that looked into a meeting room and added their logo to the outside window. This created the ability for those in the meeting room to use the glass wall as a whiteboard but prevented anyone from seeing what was being written. Back in December, we were contacted by Tonya Bailey of Stone Mountain Dental in Stone Mountain, Georgia. 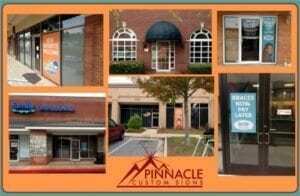 From routine cleanings and fillings to dental devices, Stone Mountain Dental P.C. is equipped to handle all your dental needs. 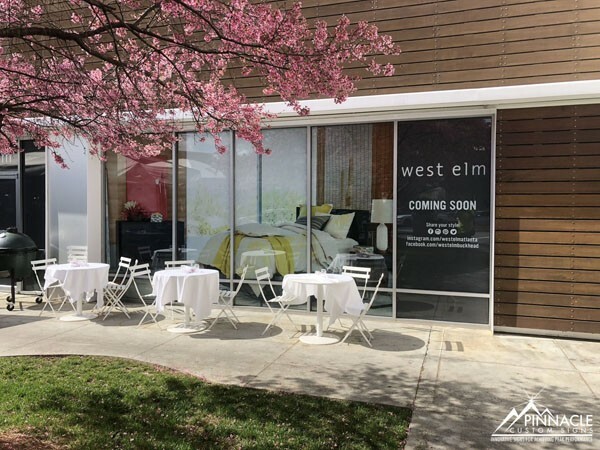 This particular business was looking to get window graphics for their four large storefront windows, as well as informative vinyl lettering for their front door. They were hoping to make their office more visually appealing and inviting. Tonya had an idea of what her company was looking for, but needed some help creating a design. It took a few revisions to get the exact look that they envisioned that also correlated with the demographics of the area. 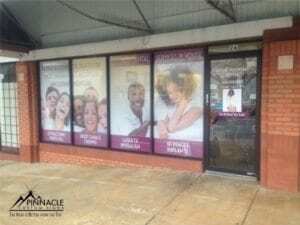 Additionally, they wanted the window graphics to display some of the services that they provided such as root canals, extractions, crowns, etc. Once we got the design just the way they wanted it and installation time arrived in January, we had an extremely frigid cold front pass through the Atlanta area and had to postpone the install job until the middle of the month. This happens any time the temperature is below 40 degrees. Weather this cold it makes it more difficult for the vinyl to stick when applying. However, once Josh finished installing all the vinyl and graphics, Tonya, along with the rest of Stone Mountain Dental’s team, were extremely satisfied with the finished product. As you can see from the job pictures, they now have a front entrance that attracts customers and gives off a nice, cheerful look. This was the first job where Stephanie, handled the job from start to finish, and it was a great learning experience. By working with the customer, she realized just how important good quality customer service is, and that communication is key when coordinating with a customer. Making sure that you get a thorough understanding of what the customer wants is imperative in deciding what to use in terms of design and material. In Buford, GA we have several vehicle dealerships near the Mall of Georgia. Many of them offer a courtesy shuttle service for their customers and we thought we would approach a few of them about adding graphics to these vehicles, creating a brand opportunity in the marketplace. What better platform to advertise a car dealership than by using a vehicle whose purpose is to drive all over town? We first worked with the Honda Mall of Georgia, whose products are some of the most extraordinary vehicles on the road today. Their service manager, Tom Houser, worked with us and had a concept that he liked and asked us to come up with some designs for him. Of course we had to give the project to Josh, since his grandfather was actually the driver of the courtesy vehicles! After a few revisions we decided to use cut graphics for the vehicle, along with some perforated window vinyl. After installing the graphics on the first vehicle, Tom decided that he would go ahead and do a second one as well. 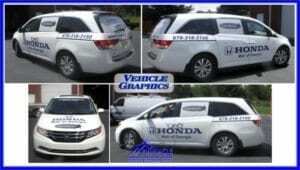 In the space of a few days Honda had two vehicles with their advertising driving all around the Buford area. We also had the pleasure of working with another dealership in the same area, Mall of Georgia Chrysler/Dodge/Jeep. 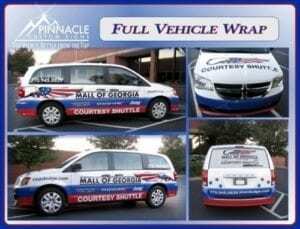 Jason Joel, one of the owners, also wanted graphics for his courtesy vehicle; however, he decided the best way to advertise his dealership was with a full wrap for one of his more popular vehicles, the Dodge Caravan. Since we had done several projects with Jason in the past, we knew the type of graphics and styles he favored and came up with a solid branding design for the vehicle. The design features the dealership’s logo prominently across the sides, front and back of the van, giving instant brand awareness to the van no matter which side of the vehicle is seen. The remainder of the design is simple and clean, carrying out the red-white-and-blue motif from the logo. The overall design really makes the vehicle “pop”, and the customer now has a moving billboard in the Buford area and beyond. As you can see, both dealerships chose a different approach to applying graphics to their courtesy vehicles, yet both solutions allow these dealerships to build brand awareness as they perform a valuable service to their customers. No matter what your budget, vehicle graphics, from simple lettering to full wraps, are one of the most effective ways to advertise your business, especially when performing a courtesy such as bringing your customers to work so you can work on their car. In early October, we were contacted by the MMI Agency, a full service marketing and advertising company based in Houston, Texas. Claudia Hinojosa and Melissa Martinez were looking for a company that could coordinate production and installation of window graphics for all the Atlanta-area locations for their client, Family Orthodontics and Dentistry for Children. 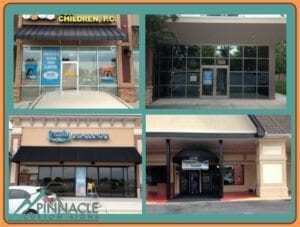 Their goal is to have updated graphics applied to all locations on a quarterly basis. We were informed that there were over 40 sites spread throughout the Atlanta area, from as far south as Peachtree City and McDonough, to as far north as Dawsonville and Gainesville. To complicate matters, they didn’t have reliable measurements since those they had were given to them by the people at the individual locations. Do a full site survey of each location so that we would have all the information we would need to service this customer in the future. Claudia and Melissa agreed with this idea, and started coordinating with their client. As with most projects, time-frames were very tight, and the customer wanted all graphics up by November 1st, a date we were given with just a week’s notice, and the graphics had not yet been approved by the client. This called for project management on a grand scale for all of the members of both the Pinnacle Custom Signs team and the MMI group. We set a schedule for creative work to be completed, approval, print & prep and installation. It was a very tight time-sensitive schedule which also included: procuring materials, identification of optimum travel routes and other logistics. Claudia and Melissa came through with the approved graphics on Tuesday. We printed overnight Tuesday, cut and prepared the graphics on Wednesday, and mapped the routes for Phillip and Matt to compete the installs on Thursday and Friday October 31st and November 1st. As the guys were out doing the installations, they sent pictures and measurements of each site back to Joanne in order for us to update our site information and get a more complete site survey. Most of the installations went off without a hitch; however, we found that the measurements for two locations were not accurate and the graphics did not fit correctly. So, for these locations, we had to re-print and go back and re-install. Now that we have a more complete the site survey, we are now prepared for changing window graphics on a quarterly basis. Additionally, with the information we collected, we were also able to make a few recommendations for additional signage at some of the locations. If you’d like for us to contact you about window graphics, please complete the form below and click the send button. Or, give us a call at (678) 714-8700 for a FREE CONSULTATION to see how we can help you maximize the use of your windows and glass doors.